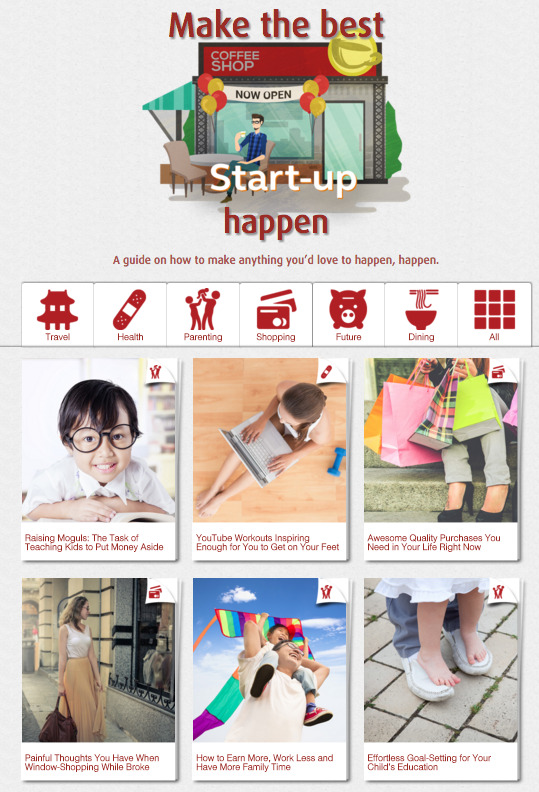 Luckyfinds: Make the Best Happen with BPI! Make the Best Happen with BPI! Each one of us put our best foot forward in school and at work to achieve our dreams. We make calculated risks in our bid to move upward and to make life better for ourselves and those we love. Recognizing that each individual has a unique dream, the Bank of the Philippine Islands (BPI) recently embarked on a campaign to help people achieve their aspirations. Dubbed "Make the Best Happen," the campaign kicked off with the launch of an animated reel encouraging the pursuit of life and lifestyle goals. The animated video serves as a reminder that we can make anything we'd love to happen, happen. BPI also introduced its microsite, www.makethebesthappen.ph, which addresses some of the areas in life where most individuals have goals to complement the video. It addresses some of the areas in life where most individuals have goals. The articles found in the microsite offer practical tips on travel, health, parenting, shopping, dining and planning for the future. A quick tour of the site shows several helpful reads such as listings of secret food stops outside Metro Manila, quirky Korean tours, inspiring workouts, some necessary life purchases, and teaching children the habit of saving. During the media launch last October 27, media representatives were sent booth hopping, earning prizes at every stop. These booths were meant to give the guests an idea on what life goal they could actively pursue. While some enjoyed some canapes and wine pairing at the dining booth, others played tourists at the travel booth, engaged in pseudo-retail therapy at the shopping booth, exercised at the health booth and did some art at the parenting booth. At the future booth, we were made to sit down with BPI's investment counselors who listened to aspirations. The counselors did some pencil pushing with our concerns and perceived limitations in mind. Together, we identified the financial barriers and discussed ways to move around them. We walked out of the meeting feeling empowered, believing that indeed, we can make the best happen. Tricia Quiambao, Head of BPI's Strategic Brand Management relayed that people come first with BPI's Make the Best Happen campaign. "We put a premium on understanding our clients and their needs, and as people become more and more aware of the world around them and the many possibilities and opportunities it offers, BPI enables them to accomplish those goals and aspirations better, faster and more efficiently," she explained. In a statement, Cezar P. Consing, BPI President and CEO, said the campaign is a reflection of the bank's commitment to empower people and achieve their life goals. Making the best happen means "helping people achieve anything they would love to happen, whether it's for leisure, education, or broadening one's horizons," Consing said. "We strive to know and understand the individual circumstances and financial needs of our clients, then offer financial advice. Only then do we propose certain solutions that are suitable and customized for each and every client." "BPI empowers Filipinos to make the best of their life happen by providing innovative and accessible financial solutions."